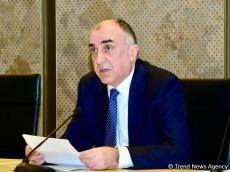 The delegation headed by Azerbaijani Foreign Minister Elmar Mammadyarov has left for Italy, the city of Milan, to participate in the 25th session of the OSCE Ministerial Council, the Azerbaijani Foreign Ministry told Trend. Mammadyarov will deliver speech and hold bilateral meetings during this meeting. Azerbaijan’s Foreign Minister Elmar Mammadyarov and acting Foreign Minister of Armenia Zohrab Mnatsakanyan will have a meeting with the mediation of the Co-Chairs of the OSCE Minsk Group (Igor Popov of the Russian Federation, Stephane Visconti of France and Andrew Schofer of the United States of America) in Milan on December 5, 2018. Personal Representative of the OSCE Chairperson-in-Office Andrzej Kasprzyk will also attend the meeting. At the meeting the negotiation process on settlement of the Armenia-Azerbaijan Nagorno-Karabakh conflict will be discussed.